Ai-ji Maedate Kabuto is a Head Armor in Nioh. 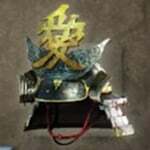 "A helmet worn by Naoe Kanetsugu, an intellegent and brave senior vassal who provided military and political support to Uesugi Kagekatsu. From the rust-lacquered ridged top protrudes the Japanese kanji for the word "love" ("ai"), and a cloud representing good fortune. The kanji for love is said to come from the first character in the name of the god of war Atago Gongen, also known as Shogun Jizo Bosatsu. A great number of warriors used the names of war gods as a way of praying to them for victory. For example, Prince Shotoku built the*****ennoji Temple in Osaka to worship the Four Heavenly Kings, and the Uesugi clan's previous ruler, Kenshin, who worshipped Bishamonten, used the first character of the god's name on his flag."